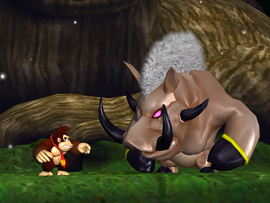 Mo-Hog is a member of the Hog species that appears in the game Donkey Kong Jungle Beat. He is one of the four Hog bosses Donkey Kong encounters. He is the king of the Strawberry Kingdom in the GameCube version of Donkey Kong Jungle Beat and the king of the Lemon Kingdom in the Wii's New Play Control! version. His name is a pun on "Mohawk", a type of hairstyle. Mo-Hog appears as a pig-like creature, with light tan skin, pink eyes, black hooves and horns, and a grey Mohawk. Mo-Hog is fought by Donkey Kong outside of what appears to the Spirit Tree. His attacks include throwing electrified melons at Donkey Kong, who must clap to make them lose their electric charge and then throw them back at him. This stuns the boss, giving Donkey Kong a brief moment to pummel him. He can also charge electricity and fly at Donkey Kong, then slash at him. Mo-Hog also slashes DK if he gets too close to him. Mo-Hog is the first Hog to use the electrical charge and throw melons faster than usual. After Donkey Kong delivers the final-blow to Mo-Hog, the Strawberry Kingdom (or the Lemon Kingdom on the Wii) is cleared. This page was last edited on April 12, 2019, at 13:09.